I don’t believe there is such a thing as an unbiased opinion. We’re all shaped by our personal experiences that give each of us our own unique take on the universe. These experiences allow us to have opinions at all. While some of us may hold very similar opinions on some topics, I fortunately have yet to meet a person who agrees with me on everything. I think the world would be very boring and unimaginative if we all fell into the same line of thinking. Given that, I am going to expound on what I think is the best reason for mounting a human expedition to Mars. I also want to explain why I think it should be an international effort that should include Canada, Europe, Russia, Japan, China, India, and possibly other countries that can contribute. A journey to Mars would offer an inspiring message to some of the people in the countries we are struggling with. Hopefully more would see a bright positive future. When I watch the news, read websites, or talk to friends, I see that a lot of people are very pessimistic and stressed out by what is going on in the world. There are plenty of things that are difficult to watch. There’s a constant threat of terror attacks. The world is facing its largest migration of refugees in history, which is threatening to destabilize the nations receiving them. Our relations with Russia and China are sinking to lows we haven’t seen since the end of the Cold War. Race relations have gotten worse. People are stressed out by globalization and what it’s doing to move and transform jobs that require constant retraining. Crime is increasing in some of our big cities. And our politicians seem unable to handle these problems. So what does that have to do with going to Mars? A great deal, I believe. In operating a business there are two key factors that determine the health of a business in accounting terms: revenue and expenses. To improve the bottom line you can trim expenses or boost revenue. Ideally, you figure out how to do both. When I see our politicians trying to deal with the world I see no imagination or creativity. I see them trying to deal with the expenses on the ledger and not the revenue. They’re like the CFO who tries to fix a broken company and only tries to reduce expenses. What is needed is a team who sees the bigger picture and how opportunities can help address the crisis which is the bottom line. I wrote this while the Summer Olympics took place in Rio de Janerio. I’ve heard people say it is a really bad idea for a country in the midst of a big economic downturn to host such an expensive extravaganza. I completely disagree. The Olympics is showcasing to the world what a beautiful and culturally rich country Brazil is. It is bringing diverse groups together because they want to compete and not because they are being forced upon each other by circumstances. I think the people of Brazil will long be proud of what they have shown the world and, in the long run, it will benefit their country. The Olympics, despite scandals of corruption and cheating, are a net positive ideology of peaceful competition that the world needs. It tells us that every country can come together and create something positive. When the Apollo program was going on in the 1960s, it had a great impact on the world. In the midst of the struggles of the Cold War, JFK understood the value of US leadership in a peaceful positive message to the world, a concept lost on most of our current politicians. In addition to all the technology it brought us, it helped put us in a position to win the Cold War. It made us look strong without having to fight another war, which may have help tip the scales of some countries falling into our camp instead of siding with the Soviets. It helped create new industries which helped give us the financial strength to persevere. It inspired us to rapidly expand math and science education to keep up with the Russians, resulting in a greatly more capable workforce. A friend of mine recently reminded me of the impact of the Apollo-Soyuz Test Project. It was absolutely stunning at the time that two nations who were on hair-trigger nuclear alert could come together and do this joint venture in space. Its impact was felt for a long time. It laid the foundation for eventually including the Russians in the ISS project. I think it helped both sides start to build trust and start thinking that we could defuse tensions. This is one of the tangible benefits of working together in space. In the Middle East, we are fighting a terrorist ideology with our military. This is dealing with the expense side of the ledger. As parts of the world try to catch up with the West there are people who are left behind. There are people who just don’t like the change and the beliefs that go along with a more tolerant, open society, including the cultural influences we export. To many of these people we aren’t offering a positive message based on their experiences and beliefs. What we can do is come up with inspirational ideas that can get people wanting to come together in a common goal the way the Olympics do. On the international stage I can think of nothing better than an international effort led by the US to set humanity on a migration to spread into the solar system that will be seen centuries from now as the greatest decision in human history. A journey to Mars would offer an inspiring message to some of the people in the countries we are struggling with. Hopefully more would see a bright positive future. If we are working with the Russians on a project that builds trust and pride in both sides, it can help diffuse tensions and help Russia not to feel threatened by the US and our NATO allies. Russia lost a lot of clout and prestige when the Soviet Union fell apart. It is understandable why they feel they are not being given the respect they feel they are due. I respect the Russian culture and their long history, though I do not approve of some of the things they have done recently. It is always difficult to go through periods of decline, whether it is a country on the international stage or an athlete past their prime. An aging athlete can find a new way of exceling possibly through coaching and passing on hard-earned knowledge. A country can renew itself through innovation and creative engagement with the world. Involving Russia as a full partner on a journey to settle Mars would be a way for the Russians to rightfully feel proud of their involvement on the world stage. We bar China from taking part in anything in our space program. I see that as an outdated Cold Ear tactic that, at best, just maintains the status quo. They are our biggest trading partner and we do have issues that we need to resolve with them, but involving China in a common goal gives us a better way to engage them on these issues. If we are offering a vision to the rest of the world where the sky is not the limit and there are opportunities for people from practically any corner of the globe to get involved, it is an ideology of cooperation and achievement that can compete against the ideology of hate. If we as a nation were to lead an international effort to expand beyond Earth orbit, it should in addition to including the main players like the US, Europe, Russia, China, Japan, and Canada. There should be opportunities for other countries to contribute. Brazil was for a time part of the ISS. They were original supposed to build the Express Pallet for the station. 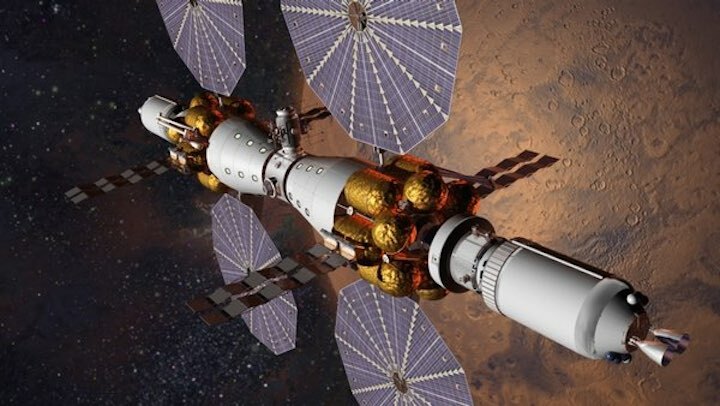 An effort to fly to Mars to build bases that could turn into permanent colonies will require a myriad of products and technologies. Within this need other countries could find their niche to contribute. It doesn’t have to be on the scale of a heavy-lift launcher or a Mars lander. It could be in components used in agricultural modules or the food supply sent with the crew or tools to use on the surface during EVAs. It could be anything that gets the world to pull together for a change. Imagine if Brazil joined either alone, or as a part of a group of South American countries, developing mining tools for the Moon and Mars. An international effort led by the US to expand a human presence to the Moon and Mars is working on the revenue side of the ledger. I personally think returning to the Moon and going on to Mars is the right kind of idea that can inspire the rest of the world, especially if they are included. If we are offering a vision to the rest of the world where the sky is not the limit and there are opportunities for people from practically any corner of the globe to get involved, it is an ideology of cooperation and achievement that can compete against the ideology of hate. It is a bit ironic that, given this opposition by civil rights leaders in the 1960s to spending on space, that the Apollo program helped create the technological and entrepreneurial wave that has been in a big part responsible for the unprecedented global economic growth of the last 30 years that has lifted hundreds of millions, if not a billion or more, people out of severe poverty around the globe. After the fact is usually the best time to judge the results of any endeavor. The problem is if the results are stretched out over decades fewer people connect the dots. Both the disenfranchised in our nation’s inner cities and refugees that desperately want to come to Europe or the United States have something in common. These are people who have been left behind or damaged by the changes in the world. If minorities in places like inner-city Milwaukee disadvantaged feel out of place and left behind, imagine what an uneducated refugee with no understanding of Western culture will be going through when they get here. It is truly understandable why Europe, with the much bigger influx of refugees, is having serious problems. Modern jobs that pay enough to give people the quality of life they see so many others have requires a good education. If a mission to Mars includes a global educational initiative to help people understand the technology making the mission possible, it will inspire millions of children who currently have a bleak future. Several years ago, in response to one of my articles, I received an e-mail from a woman in Kenya. She was telling me about a young man who was so in wonder of the airplanes he could see flying above his village that he tried to build his own airplane. She asked me if I knew of any resources that could help this person get an education and a career in aviation. I forwarded her a name of a person I knew involved in the Experimental Aircraft Association’s Young Eagles program. I don’t know if they were ever able to help, but it emphasized to me how just seeing advanced technology like aircraft can inspire people practically anywhere. When the modern world intrudes on the far corners of the world, our technology has to seem at times like magic to some. When I followed Apollo as a child I found everything I could about how rockets and spacecraft work. It was no longer magic to me. It was more wondrous than that. It was understandable and made me think I could become an engineer. If a mission to Mars includes a global educational initiative to help people understand the technology making the mission possible, it will do the same for millions of children who currently have a bleak future. I could imagine a global education initiative to go along with a journey to Mars that could create lessons about the mission that teach the core skills that every economy in the world needs. Lessons in trajectories and orbital mechanics are a great way to teach math and physics. Lessons in how to feed a crew of a growing settlement is a great way to start teaching basics of agriculture. Lessons on how spacecraft are designed and built are a great way to start teaching the basics of a wide variety of engineering disciplines. Many of the skills students need to learn if they want to eventually take part in future space missions are the same skills needed for a modern economy on Earth. Most people who took the math and science classes that were rushed into our schools after Sputnik didn’t go on to work at NASA. They built the rest of our modern economy. As part of the global education initiative there could be spacecraft and base design competitions at various educational levels from grade school through universities. It might be interesting if these teams were comprised of students from two or three schools that had to be on different continents working together over the Internet. Imagine the experience a team of students from a Milwaukee high school in worked with students from Shanghai and Paris, or Kabul and Sydney, or Rio and Bangkok. The students would learn what companies are already doing with product development spread out around the world and around the clock. These students would be gaining skills that are in high demand. We as a nation are about to spend roughly a trillion dollars over the next 30 years to refresh our nuclear triad with very little public debate. This includes fielding a replacement for our arsenal of Minuteman missiles, a new nuclear-tipped air-launched cruise missile, and upgrades to our strategic bombers and Trident submarine fleet. While we’ve been sticking with our aging nuclear stockpile, Russia and China have been upgrading rapidly and spending heavily on all aspects of their militaries. A strengthening nuclear umbrella is one reason I think China and Russia have been flexing their military muscles and ratcheting up tensions in the world. Moreover, the nuclear threat from smaller players like North Korea, Pakistan, and Iran is increasing. Given the state of foreign relations in recent years, I doubt there will be much serious opposition to our trillion-dollar nuclear weapons investment which is far more than what is needed to send humans to Mars. I also doubt if there will even be much of a discussion about if all three parts of our nuclear triad are still needed for a credible deterrent. The psychology of international posturing just doesn’t work that way. I recently returned to the neighborhood I grew up in. When I was a child it was home to people with a mix of occupations you don’t see any more. My father was a civil servant working for the US Forest Service. The neighbor across the street owned a cabinet making shop. One family owned a bar and a sod farm. One neighbor was a retired CEO of Harley-Davidson. Another neighbor was a senior vice-president of Schlitz Brewing, which had just lost its title of world’s largest brewer to Anheuser-Busch. Other neighbors worked as machinists, corporate lawyers, sales reps, executives, business owners, masons, teachers, electricians, and so on. We all knew each other. The kids played on the same sports teams. We were in the same schools. I don’t see people mixing across economic class as much these days. It is part of what separates us now. Over the course of my life I have had a chance to meet and talk in depth with some of the most interesting and influential people on the planet. This has included members of Congress and members of the Pro Football and Rock and Roll halls of fame, aviation and space pioneers, CEOs of huge multinational corporations, presidents of small companies, technical and scientific geniuses, great athletes and emerging musical stars, and more. I would be greatly embarrassed if I hadn’t paid attention and learned something from these opportunities. What I found in common with all of these people is a great passion for what they do. I gained my great passion for science, engineering and exploration by following the space program as a child. When I watched Neil Armstrong and Buzz Aldrin land on the Moon, the driving passion in my life was set. In the long term, I think expanding humans permanently into the solar system will be seen as one of the biggest, most positive steps ever taking by our species. In the short term, I see its biggest benefit if done right as helping us here with our economic and social issues, which I see as completely interconnected. In talking with my friends and acquaintances that come from all walks of life, I discover that many of them also followed the space program with great interest as children. One friend of mine, who has spent most of his life moving from one garage band to the next, recently told me that as a kid he had every model he could find of Mercury, Gemini, and Apollo. Regardless of their level of interest, most kids back then paid at least some attention to what was going on. Many parents let their kids stay up late to watch on TV what I think they instinctively knew was a massive moment in history. The impact that a global plan to go on to Mars could have on children across the world, motivating them to pursue an education and careers in STEM fields, would be enormous. A global initiative to Mars has the potential to modernize and inspire much of the world. Human beings, especially political leaders, are driven by emotion and egos that can be fed by both negative and positive influences. Lately the world has been driven heavily by negative influences. It is time for a positive influence that mirrors what Apollo provided. In the long term, I think expanding humans permanently into the solar system will be seen as one of the biggest, most positive steps ever taking by our species. In the short term, I see its biggest benefit if done right as helping us here with our economic and social issues, which I see as completely interconnected. I see it helping to diffuse our regular insanity in foreign relations. IIt is not a panacea, but it can have a bigger positive influence than anything else I’m hearing suggested. I just had a near-death experience. I was stung by a bee and had a massive allergic reaction. I’ve been stung probably a few times times in the last half century with barely any reaction beyond a red spot and stinging that lasted no more than a minute, so I didn’t know I had become allergic. But I did recognize the signs of a severe allergic reaction. I was quickly becoming covered with hives from head to toe so I drove myself straight to a nearby emergency room. At the ER they took me immediately to one of the exam rooms and hooked me up to an EKG, a blood oxygen sensor, and a blood pressure cuff. My pulse and blood pressure were going through the roof while my blood oxygen levels were steadily dropping, so they quickly gave me a shot of epinephrine in my thigh. The reaction eased off a bit and after about 20 minutes my cell phone rings. The nurse told me I was doing fine and it was okay to take the call. A couple of minutes into the call I started having severe spasms in my chest. The doctor had the nurse give me another shot of epinephrine in my other thigh. It took about five minutes for it to start kicking in and my symptoms started slowly going away. A couple of hours later they let me go home. If I had waited another ten minutes to go to the ER, I might not have made it. I think most people, as they get older, ponder their legacy, whether it is their children or what they have done to have an impact on the world. I’ve never been married and don’t have children so I ponder the impact I have had on the world and the people around me. While some people say a near-death experience can wake you up to how you should be living your life, I think mine just sharpened the focus of what I want to yet accomplish. The best reason to go to Mars now is that it will improve life on Earth. I’m a strong believer that expanding into space is in the best interest of the human race. It’s the reason I write these articles. If my voice can be just one small part of what sets the human race on the journey to the stars, it is a sufficient legacy for me. None of us knows if we’ll be around to see the first human setting foot on Mars or even see tomorrow morning, but that isn’t the point. I would like to see it happen, but being confident that it will happen is more important to me. Also knowing what a collaborative effort among nations to get there could do for the human race here on Earth is the most important thing right now in my opinion. When the space race was going on, the most important reason it was funded was the battle for global prestige with the Soviet Union. It was a big part of winning the Cold War. As time has inevitably continued its march forward, other reasons it was a good idea have become obvious to me. These reasons include the massive push forward in technology and STEM education that has helped us economically and has linked the world together. But at the time, the best reason was it was a battle in the Cold War that we won. If we embark on a global project to send humans to Mars, it is a way to get nations to work together in a constructive way. In doing so, we will create new technologies that will build our economies and solve some of our worst problems. We will strengthen global business, raising wages in emerging economies as well as in the developed world. If we include a global educational initiative, it will help give more people at home and abroad the skills needed to compete in a modern society. We will leave fewer people behind. We will give people reasons to include themselves in positive activities on the revenue side of the ledger. I see it as an investment that will have a better outcome than the trillions of dollars we and our fellow earthlings will inevitably be spending just on our nuclear arsenals. The best reason to go to Mars now is that it will improve life on Earth.